Ingredients: PORK, WATER, CORN SYRUP AND LESS THAN 2% OF THE FOLLOWING: PORK BROTH WITH NATURAL FLAVORINGS, SALT, DEXTROSE, NATURAL FLAVORS, BHA, PROPYL GALLATE, CITRIC ACID. Instructions: Previously handled frozen for your protection. Refreeze or keep refrigerated. Preparation: Thaw product prior to cooking. Sausage is fully cooked when the internal temperature is 160 degrees F. Grill: Preheat grill to medium-low. Grill covered for 15-20 minutes or until cooked through and browned, turning links often. Skillet: Spray a skillet with cooking spray. Add sausage. Cook over medium-high heat until browned, about 5 minutes, turning links often. Reduce heat to medium-low. Carefully add 1/2 cup water to skillet. Cover and simmer for 12 minutes or until cooked through. Storage: To ensure quality, refrigerate and prepare within 3 days; otherwise, freeze up to 30 days. Safe Handling: This product was prepared from inspected and passes meat and/or poultry. Some food products may contain bacteria that could cause illness if the product is mis-handled or cooked improperly. For your protection follow these safe handling instructions. Keep refrigerated or frozen. Thaw in refrigerator or microwave. Keep raw meat and poultry separate from other foods. Wash working surfaces (including cutting boards), utensils and hands after touching raw meat or poultry. Keep hot foods hot. Refrigerate leftovers immediately or discard. Cook thoroughly. I've always been a fan of these. I hadn't seen them at this location before, so I was glad to see some new items. They were frozen as well which was convienent for me since I buy quite a few and freeze them after purchase anyway. 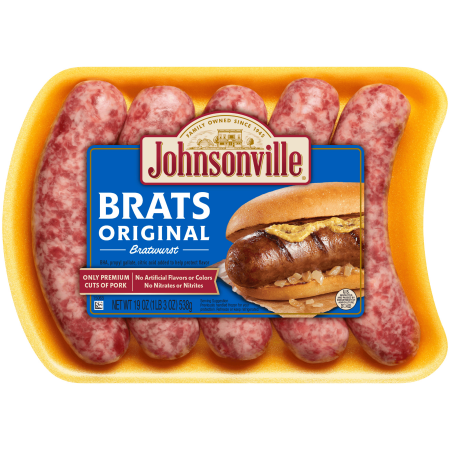 Delicious but used as a substitute because you always run out of Johnsonville original SWEET sausage. You always seem to stock plenty of mild and/or hot; but rarely SWEET. Makes for good fill you up after work supper. Toss them on the grill add pork and beans along with Lay's potato chips. You have a quick supper an very filling. Our whole family loves them. If we want to have people over, we always include them on the grill for cookouts. My husband buys these all the time, and eats them whenever he wants a quick snack and dinner isn't ready yet.